This review is from my new favorite blog, The Ramblings of a (Future) Jedi Librarian. I was given this book in August, and it is well worth the read for English majors, Shakespeare buffs, and Star Wars fans alike! But I’ll let the Jedi Librarian sum up. In honor of Star Wars Reads Day, I’m reviewing one of the newest Star Wars books to hit the shelves. This is quite possibly the oddest, yet coolest combination to come out from Quirk Books, who added Zombies to Pride and Prejudice to make a runaway bestseller. This version by Ian Doescher combines my first love with The Bard, and as a former English major who took two Shakespeare classes I can’t resist it. Translating the famous lines of Star Wars to iambic pentameter has some hilarious results, and translating some of Shakespeare’s famous lines to a Star Wars setting are equally hilarious. These last two lines of the prologue, a re-imaging of the famous yellow crawl, invokes part of the prologue from Romeo and Juliet. At least in my opinion. The opening lines of Act 1 Scene one though is a clear parody of the opening lines of Richard the III. I laughed hysterically. And it’s not the last time a line mirrors or spoofs a line from a Shakespeare play. Clearly, Doescher knows his Shakespeare. And his Star Wars. The nods to Shakespeare are part of what makes this spoof so funny, it’s not just in iambic pentameter, it actually uses his plays as a template and inspiration. And as Doescher believes, Star wars is full of characters and events commonly found in Shakespeare plays. Lovers, sword fights, evil villains, rogues, princesses, good vs. evil, the old wizard or kindly friar like character. Even if you aren’t familiar with Shakespeare, I think you’ll be laughing at the hilarity of it, or at the very least at the drawings of favorite characters dressed in Medievil dress. Unfortunately, I found the almost constant asides by Obi-Wan and C-3PO anoying after a while. I know Shakespeare utilized the aside to have the characters talk directly to the audience, but I don’t recall him using it as often as Doescher seems to. A few times is OK, but in almost every seen starts to get annoying. That being said, it’s my only criticism. Overall it’s a hilarious retelling of a Scifi classic with classic literary flair. 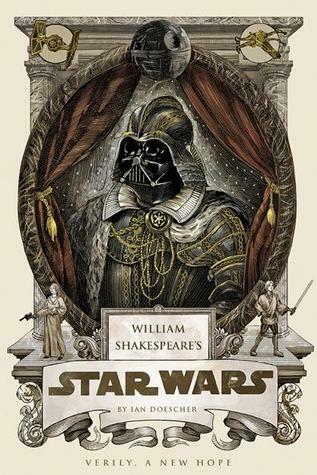 I recommend it for English Majors and Shakespeare fans that also happen to be Star Wars fans, and for Star Wars fans that love a good laugh, and just happen to be Shakespeare fans as well. In the mean time, I’ll be waiting for a Sheakespearean treatment to The Empire Strikes Back. So this past Thanksgiving, something unusual happened, unusual but pleasant. I logged into WordPress because I’m a lonely internet geek, and I saw the little yellow square I pretty much live for all lit up like a beacon: a comment on my blog! Yay! Furthermore, this comment indicated that I had just been nominated for a blogging award. To get this award, all I need do is follow a few simple steps. Well, I’m touched and flattered by the tribute, and certainly am always open to the publicity. Right now I’m trying to come up with a new challenge for post population, ’cause that was fun, and hoping to bring in a few guest posts as well. But first, on to the awards ceremony. Okay, and thrilling music subsides. Hi. Good to see you all. What award did your beloved Star Wars Librarian win, you might wonder? Well, The Wookiee Gunner has presented me with the blogging Liebster Award! (view award post here) So thanks, Wookiee Gunner! This is award granted to bloggers by other bloggers, and operates in a way some might consider undignified, that is, by the old chain letter schtick. Nevertheless, its purpose is to promote small or unknown blogs, and when the research of said award led me to several blogs I had never read before, I had to admit it had done its task and I would accept the nomination. For details about the Liebster, click (here). According to the rules of this award, by accepting this award, I have agreed to the following — to repost the rules, to answer 21 random questions, and to nominate, question, and notify other blogs I consider worthy of the award. Very well. Now, I’m not going to nominate ten bloggers. I have a very good reason for this, and a reasonable justification: first of all, I think that a nomination has more meaning when it is restricted to a few. I read in the official rules that I linked to earlier that one version of the rules called for nominating five, so I give you five. Books Are Better (booksarebetter.org) — It’s no secret that I love books, and I think they love me back. And while I’m not one to restrict the availability of knowledge, I want people to think, be aware, and appreciate books for what they are. This blog promotes a message I feel deeply about — in their own words, “books may not be the only choice, but they are the better choice, and will be for a long, long time” (via). Life Between the Coffee Spoons (betweencoffeespoons.wordpress.com) — We underemployed starving librarian types need to stick together! Personal blogs are the hardest to recommend, but with creative challenges, book reviews, and library happenings, this blog makes counting out your life in coffee spoons a little more bearable. Unless you’re not an underemployed starving librarian; in which case, it’s just fun. Tome Raider Files (tomeraiderfiles.wordpress.com) — This blog has the absolutely cleverest name I have ever seen on a blog. Period. The Tome Raider (whose main blog is Scarlet Inkwell) delves into books and tells you what’s worth reading. She also gives author history, interesting tidbits, and suchlike.The problem is, she has not updated in a very long time. Maybe if you all bombard her with requests, she’ll come back! Modern Jedi (themodernjedi.wordpress.com) — Another blog that has, sadly, been on hiatus for a good long while. But I love what I’ve read from her and been hoping she’d make a grand return, as Jedi are wont to do. I love a blog with a lot of pictures, and when it’s plus fun prose, well, that just does it for everyone all around! Even if the Modern Jedi doesn’t return, her archives are a fun read, and I think she deserves the award. Claire Cooks (clarecooks.wordpress.com) — If you think I’m as indifferent to food as your average Star Wars character (seriously, when do these guys eat? ), well, you’re wrong and haven’t been paying attention to all my party posts. As a kid, I liked to look at cookbooks for the pictures; now I just use Pinterest. But I love to check up on Claire Cooks. Good food, good pictures, plus trips and tales about traveling. What’s not to love? That’s right. Dark Lord of the Sith, baby. And my main men. Women. Bounty huntresses. Okay, that metaphor got away from me. PS, just like how there’s a bounty hunter off the screen in this picture, there’s a sixth blog I would totally nominate for this award, but I only found out about her because she was nominated alongside my blog by the Wookiee Gunner! While the rules state you can nominate someone who’s been nominated before, I feel weird nominating someone who has received it at the same time I did. But you should definitely check out The Ramblings of a (Future) Jedi Librarian because it’s a great blog. Caffeine has absolutely no effect on me, unless it actually makes me sleepy. The poshest thing I have ever done is eat lunch at The Savoy Grill in London. The smell of paperback books printed in the mid- to late-90s is one of my favorite scents of all time. I can pretty much identify the decade a book was printed in by scent if it was printed within the last 100 years. I actually have surprisingly sharp hearing; the reason I consider myself a bit deaf is I utterly cannot filter background sounds. Psalm 119 was my least favorite portion of Scripture until it became my favorite and now I can’t read it enough. I am rarely (if ever) as worked up, passionate, or emotional about anything as I (apparently) sound; I’m a pretty satirical person. I really like packing stuff. I don’t hate the word moist. Why did you start blogging? It was 2005, my best friend and I were going to college 3,000 miles apart, and Xanga was up and coming. Or do you mean this blog? I started this blog because back in 2001, I had a very hep Star Wars fansite called Kyane’s Homepage (ranked #75 on StarWars.com’s Top 100 Fan Sites before they discontinued them) where my conceit was to answer any Star Wars question from anyone. Three years ago, a friend of mine asked me a question about the Death Star, and I abruptly decided a reference desk Star Wars blog would be the comeback I was looking for. En voila. What’s your plan for the future? Get a job. A real job at a real library with a break room and everything. Pay off my student loans. Have a home. Get my books out of boxes and onto shelves and hug them and never let go of them until I have to go to work. Go to work. Work hard. Make the most of myself. Redeem the last lost ten years. Is that too specific? Do you still watch cartoons? If so, which ones? I really never did watch cartoons in the first place. Basically the only cartoons I have ever religiously watched was Homestar Runner, and when they stopped with the updates, well, I just wandered off. What movies could you watch over and over and still love? Apart from the obvious — at a conservative estimate, I’ve marathoned all six Star Wars films a good hundred times, not including individual watchings — I utterly love the movie Fanboys. But I’m not in a good place to answer this right now because frankly as aforementioned underemployed librarian who doesn’t like to read when she’s depressed, all I’ve done this year is watch the same movies over and over. Seriously. I’ve watched Bourne Legacy eight times since like June. Occupations you wanted to be when you were a kid? The first thing I ever wanted to be was a paleontologist until I saw how horrifyingly dirty they got. Other early ambitions were author and missionary pilot. Are you reading any books right now? If so, what? I’m wrapping up my alphabetical challenge; only three from the end, and presently on Mr. Midshipman Hornblower by C. S. Forester. I’m also working on a stack of textbooks on cataloging and librarianship. What’s one thing you would like to change about your life? All I would do is tell my twelve-year-old self, “You want to be a librarian with focus in rare books, special collections, and technical services.” That would be enough. Because then I would have been a more aggressive volunteer at the local library; I would’ve asked to shadow their cataloging department; even if that still didn’t get me a job there at 16, 18, or any of the other innumerable times I’ve applied there, I would’ve had excellent experience. Also, when Dr. George offered to start paying me himself, I would have gone back to work study to work at the campus library. Then I might have gotten the job I have now back in 2008. I would have applied for libraries in the tricounty area until I had a job, and then, with a good decade of volunteer and work experience at my back, I would have gone to grad school. I would have gotten work while earning my MLS. I wouldn’t spend the next 18 months after graduation bleakly unemployed, underemployed, and effectively homeless while doubling my loans on deferment. Oh, look, I’m sorry, I’m depressing the young people . . . moving on! What fictional world would you like to live in? The one where jobs grow on trees. Ah! Sorry. I’ll stop for the yet again time. There is a fictional world I’d like to live in, but it’s one I created. Still, in a pinch, I’d accept living in the Star Wars universe. If you were given one wish, what would you wish for? That whole going back in time thing to tell my twelve-year-old self to invest in becoming a librarian? Or does the wish preclude time travel? Then I just wish I had a full time job. How big of a Star Wars fan are you? Out of the six Star Wars films, which is your favorite? What’s a book (any book) you think everyone should read? What’s a book you love that no one else (or very few) loves? If you had the power to make one fictional character a real person in your life, who would it be, and would it be romantic or purely platonic? You buy a copy of one of your favorite books and find out it will transport you to the book’s world (like in Myst). What’s the book? Where is one (real) place you’ve always wanted to go and haven’t been? If you could live absolutely anywhere for one year, expenses paid, where would it be? For one day, you are the most important person in the universe. What do they make you for dinner? 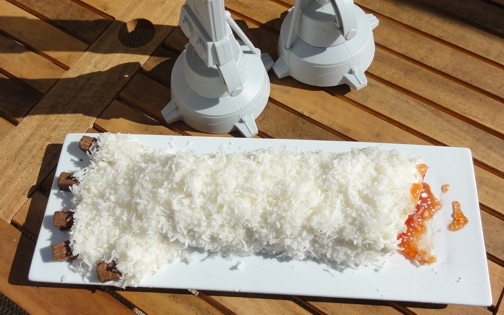 In your mind, what would make the coolest homemade Star Wars cake of all time? All right! Good day and thanks for playing. Last Friday was the 30th anniversary of my favorite, Return of the Jedi. I like to do parties and stuff to commemorate big Star Wars anniversaries, but I couldn’t get anybody to do a party with me. So instead I made some cake pops and iced coffee and watched ROTJ over the phone with a friend of mine. Because I was basically keeping it simple, I just took the chocolate cake recipe out of the booklet that came with the pop maker. It’s actually really weird to make real batter after mug cakes, because “3/4 cups flour” seems like so much! This batter is the runniest out of all of them, but I finally figured out the best way to pour it out using a glass measuring cup, so this was the most convenient run of this. They bake for 5 minutes. I could probably get almost a full dozen more pops if it weren’t for how much batter I keep spilling over — but I don’t get that much practice. Gordon Ramsay would seriously not approve of their unevenness. Then, after extracting them from the cooker, I dropped them in a bowl of confectioner sugar. The idea here was that these would be “unfinished Death Stars,” see? Since they’re round and dark and stuff. It may be a stretch, but this was an epically low-budget, low-effort celebration. You may ask what those few pariah cake balls are there to the side. Well, okay, since you asked — I thought of this experiment while I was working on this. What if I stuck some caramel filled Rollos into the cake while it was baking? And I thought, you know, they might be like the Death Star core or something, all melty and caramel. Anyway, I got them in successfully and they baked very well. Unfortunately the problem was that the cake pops wouldn’t come out of the holes and kept separating, so they didn’t look aesthetically pleasing at all. Not even a little. But flavor taste = sensational! Despite all that, though, the taste was absolutely amazing. So not a complete flop; definitely something to pursue. Anyway, after all of that, I loaded up my Imperial mug with mini Death Stars, fixed up some iced coffee, and settled in to watch the best movie ever. Ah. Happy 30th birthday, ROTJ. A modest but satisfying collection. Doing Death Stars via Mug Madness. Because May is Star Wars parties month, I’d like to call your attention back to the last two parties I’ve done by pointing you in the direction of the posts done on them, and also to reblog this post from HS that I did on some parties I’d like to have in the future. 2009: The 10th Anniversary of Star Wars: Episode I: The Phantom Menace, and the first time Michelle came out to visit in Ohio. She and Kristine and I threw the first of several Parties of the Century. Read more (here). 2012: The 10th anniversary of Star Wars: Episode II: Attack of the Clones, and the first time Michelle came to visit in Indiana. She and Kristine and I threw the second Party of the Century. Read about it (here). The third Party of the Century hasn’t occurred yet. 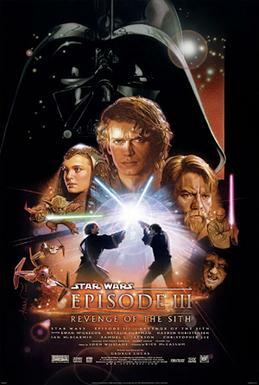 That’s because the 10th anniversary of Star Wars: Episode III: Revenge of the Sith doesn’t happen until May of 2015. But in the meantime, these sorts of things take awhile to plan, especially since I mean for the third party to the best one yet, since, after all, E3 was the best prequel. The guest list includes Kristine, Michelle, and Allison, as well as myself, and even though it’s a couple years away, I’m enjoying the planning process. Besides which, there are other Star Wars milestones coming up. Return of the Jedi, which is my favorite of the original trilogy, celebrates its 30th birthday this May . . . which is why it’s kind of frustrating that my biggest theme party I’ve come up with so far is for Empire Strikes Back! But regardless: these are the next two Star Wars parties I’m working on. If you count the tauntaun, there will be exactly this many guests at my “party of the century”! Winter parties are cute. So it must follow that a Star Wars winter party must be freaking adorable; plus there’s so much material to work with! I originally meant this Hoth/Empire Strikes Back-styled party to circle around the release of one of the films to 3D, so that the party could relocate to the tridimensional theater of our choice and then reconvene for the rest of the party on a buzz of lightsabers in 3D. However, the first dampener was that ESB wasn’t due out in theaters again until 2017, followed by the fact that now I have no idea when its 3D release is scheduled. But let that not stand in my way! This party will take place in some wintery month in the near future, and it will be awesome. Each one a unique work of art! First of all, let’s hear about the decorations, because every party requires decorations. Your Episode V locales include Hoth, Dagobah, Cloud City, and interiors of the Executor and Millennium Falcon, so action figures and toys from those settings will be the most appropriate. Also, check this out . . . awesome Star Wars snowflakes via Matters of Gray. Remember spending hours folding paper and cutting them into patterns that would vaguely resemble snow crystals? Now they can vaguely resemble iconic Star Wars characters and objects as well! Yes! Enough with decor. Let’s get on to the food. Food is why we party is it not? I found this great inspiration: if you’re going to have a wintery party, you need to have hot refreshments, and what’s hotter than chocolate? I found this adorable inspiration for a hot chocolate bar on Pinterest (via), and figured with minimal effort, it could be Star Warsdized into a Hoth Chocolate bar. You have all your fixins’ for good cocoa, but I also have a recipe for real hot chocolate (not cocoa: that is, a block of chocolate melted with milk), and we could have a good old crock pot of that. Mostly it’s the fixin’s I’m in to — marshies, cinnamon, peppermint. Need cutesy Star Wars names for them, like “gimer sticks” and “Ugnaught brains,” etc. Also, maybe frozen hot chocolate. If Luke cutting off the wampa’s arm is foreshadowing Vader cutting off his hand, is the wampa somehow related to Luke? Now, everyone goes on about how gross this cake looks, but I assure you, I intend to improve it by not using coconut. I know, I know, coconut is disgusting, and besides that, a full third of my guests are allergic. That isn’t why you thought it was gross? What? But . . . but it’s orange. Why is that gross?! The original blogger said one person ate the cake with eyes closed because it was too gross to look at, and I gotta tell you, I’m flummoxed. I may have closed my eyes every time Han cuts the tauntaun open until I was about 25 years old, but even I’m not squeamish enough to have my gag reflex tripped by . . . orange blood. *eyebrow* I don’t even know what guava jelly is. (Incidentally the wampa obviously didn’t bleed, but whatevs.) I intend to make it a red velvet with raspberry jelly, because when you’re making severed arms, it’s only reasonable that you use red velvet. Everyone knows this. And then I’m going to make white cotton candy to use for the fur. I think that’s a great cake. Like twins separated at birth! Also up for grabs on the dessert table, Boba Fett ice cream sandwiches, chocolate Han in Carbonite, pretzel lightsabers, and Cloud City cake pops. Because Cloud City looks like a cake pop, see? It’s abstract, okay! Because of the nature of the party is to be mainly hot chocolatey, I’m not worried about there being any sort of a main course, just desserts. Naturally for entertainment — you have to ask? — there will be the watching of Empire Strikes Back and possibly lightsaber dueling it up with pool noodles decked with duck tape. You never know. Sabacc? Who here knows how to play Sabacc? We could use the deeds/money from Star Wars Monopoly for stakes. I know I wanna con somebody out of a Tibanna gas mine. Maybe weeding out all the Episode V questions from the Trivial Pursuit game is a thing. Episode III comes out in three-dee this September, but my party’s not slated until 2015, which is ten years since its release. That gives me plenty of time to really make this a party of epic proportions. It’s in very preliminary stages, but here’s a quick overview of some things taking shape. I found a really inspiring post on At Second Street, which pointed me to some inspiring murals on Painted Daisies; the idea is to cover the windows, etc. to make it feel like you’re inside a spaceship. Black plastic tablecloths, paint, stickers to complete the effect. “Coolglow.com” sells glowing paint for $10 a bottle, which looks like regular paint until you turn out the lights, and then it glows; the paint can then be used for stars and to recreate the crawl and opening titles. (They also sell glowing drink-ware and mini glowing lightsabers, so this is a site to hang on to for any kind of Star Wars party supply. Glow gives it that extra kick.) Another fun decor idea, courtesy of At Second Street, is to stick toothpicks in those little holes in action figures’ feet and use them for decorations. I also have my entire collection of Episode III merch, including posters and action figures like my enormous boga figure. Obi-Wan’s starfighter being attacked by buzz droids! No, I don’t have the mechanics of how to make all of the buzz droids, but I’m going to use the cake balls for the domes. Anyway, there’s the cake. I have a recipe for a delicious-sounding lava juice, because naturally there’s got to be lava somewhere at an E3 party. I also want to give some more thought to main courses — “Han-burgers” are extremely over-done, I think, but I want to do something clever. Entertainment obviously focuses around watching Episode III. There’s always Mad Libs and Obsessed With Star Wars to play, too. Plenty of time to work that out. Party Planner via Hundredaire Socialite. Today’s very fun Friday guest blog is, as usual, from HS, where I rediscovered this funny rant on George Lucas’ mathematics. As usual, click the link to view the entire post; it’s been shortened for SWL. The most fun math is what I call bogus math. I use the term to refer to anything unconventional and especially fictional. For example, there was this time that I calculated the population of Coruscant. Today’s particular bogus math I wanted to talk about, now that you’re all paying attention, is again Star Wars related. I know you’re all thinking, “She wants me to believe she’s got dyscalculia but likes computing all this stuff?” Well, I have a superpower called Wolfram|Alpha, which I can use to calculate anything. In Astronomy and the Bible, I read that it would take 100,000 years to cross the galaxy at the speed of light and I suddenly began to wonder how long it would take at Han’s boasted, “She’ll make .5 past light speed.” Thus I found out that Wolfy will calculate ly speeds for me ! I asked for lightspeed +50%, and it replied 1.5c. (Which caused me to remember the question that inspired this blog: What is the propulsion system on the Death Star? In researching the Death Star, I found a book that said its maximum speed was 1.2c, and nothing would tell me what c stood for! It’s speed of light in vacuum.) Then I asked what it would take to get to Alpha Centauri at a rate of 1.5c — 35 months. This got me thinking about the sublight run for Cloud City from Hoth in ESB. Well, I got out my map of the Star Wars galaxy, which is conveniently scaled that 1 pixel = 15 parsecs = 48.9 ly, and counted four pixels between Bespin and Hoth. Unfortunately for Lucas, this comes up to 195.6 ly, and a 130-year journey for our heroes. If the Millennium Falcon went into lightspeed, its passengers will be too old to do anything when they get back. This is ridiculous, George! He really seems to use hyperdrive and lightspeed interchangeably: “sublight” is non-hyperdrive. Piett tells Vader, “If the Millennium Falcon went into lightspeed, it could be on the other end of the galaxy by now.” But as I believe I have demonstrated, even the smallest possible distance, 15 parsecs, would take 32 years to travel at the boasted .5 past lightspeed! I can’t even justify it by thinking maybe Han should have said “she’ll make five times lightspeed,” because that’s still 9 years to go 15 parsecs. I understand George rarely knows what he’s talking about and there are a lot of tips in the movie to demonstrate this, such as when everyone exclaims how impossible it would be to shoot a two-meters-wide target from a snub fighter. Pretty obvious George has no idea what a “meter” is. Han’s “made the Kessel Run in less than 12 parsecs” has drawn a lot of flak and George has tried to cover it up a variety of ways, but frankly, it’s just because he didn’t know. Another thing! Timelining! It is insane how George condenses the saga. You think my math is bad? For George, 25 + 30 = 63 (Obi-Wan is 25 years old in Episode I; 30 years pass between E1 and A New Hope; Alec Guinness was 63 in ANH). George actually shed four years in the timeline, whichhe really needed. In 1977, Luke Skywalker was “about twenty,” maybe as old as 22. Somewhere in the intervening two decades, he became 18. Luke is born just as the Empire is founded, which means that his age must equal the years between E3 and ANH. If Luke is 25, Palpatine has a nearly-quarter-century-old empire. If Luke is 18, the empire is a mewling teenager. Also, a more mature Luke in ANH = a Luke more on par with Mark Hamill’s actual age and appearance in ROTJ. WHAT ARE YOU DOING TO ME, GEORGE?! Obi-Wan, Owen Lars, and Aunt Beru age in astonishing and horrifying way if you leave 18 years between E3 and ANH; I pointed out Obi-Wan’s unpleasant aging (you’d think Jedi would age slower than the general population! ), but Beru and Owen? Even if he’s older than Anakin, Owen can’t be older than 25 in E3. He’s barely in his 40s and looks like a craggy old man in ANH! Let me help you out, George — again. Anakin is 9, Padmé is 14, and Obi-Wan is 25 in E1. Give them 13 years before Episode II, and say they’ve worked with Padmé again within the last ten years. That gives her and Anakin some more footing. That makes Anakin a comfortable 22, Padmé a realistic 27, and Obi-Wan a mature 38. The Clone War is an established three year event, putting their ages at 25 (Anakin), 30 (Padmé), and 41 (Obi-Wan) at the birth of the Empire. Call Luke 22, which parallels neatly with Anakin, and this makes Vader 47 and Obi-Wan 63 — the exact age of the actor who played him. You’re welcome, George. I know, you didn’t think this was going to descend into Star Wars, but honestly, it was inevitable. Now I’ve got a serious jonesing to go watch Star Wars . . . I haven’t done that in like three weeks! Bogus Math and George Lucas via Hundredaire Socialite. I’ve been engaged in a curious debate on the Canon page, where I explain according to the absolute best logic all my years of study have provided me, what the “true” Star Wars timeline is. I’m not carrying the debate any further, you can read it there — it’s puzzling stuff — but I thought I would re-post this from HS where I detail the reasons requiring a strict canon such as the one I’ve detailed. Canon comes from the Greek κανών, which meant a reed or rod, specifically a measuring rod. So the metaphor is obviously for a standard by which something is measured. Something which is canonical, therefore, is according to the rule or standard. There is another use of the word canon which suggests works of a particular author, such as Shakespearean canon. Now, allow me to explain my argument for why there is a need for anyone who claims to even like Star Wars to understand and define their own canon. First of all, as I mentioned earlier, “canon” provides a standard by which items can be evaluated and approved. It is not possible to simply say, “I just like Star Wars” and walk away, unless your brain is fully capable of ignoring all contradictions of time, place, character, and reference. George Lucas is a man who loves money, whatever else you can say about him, and he’s allowed anyone to come frolic in his universe who wants to if it would get him a little money. The first film came out in 1977, and early novels were produced throughout the 80sby various scifi authors such as Brian Daley and Alan Dean Foster. There are two more films in the “original trilogy,” and a “holiday special” so horrifyingly bad I’ve never pursued seeing it. Then in the early 90s, Lucas commissioned Timothy Zahn to write the first of a new series of books to continue the saga. This started with what is now called the Thrawn Trilogy in 1991. Authors collaborated loosely and were instructed not to touch on any events dating before the original trilogy, as this was what the new prequel trilogy was going to touch on. So for about a decade, a number of really shabby and quite a few really awesome books were produced. However, they weren’t the only ones in on the ball game: there were a few spin-off children’s TV shows (Ewoks and Droids), an entire universe of comic books, children’s books, roleplaying games, and radio productions. People love Star Wars and can’t get enough of it. When the flaming misery of The New Jedi Order was produced after Lucas’ particular commission from Timothy Zahn to write a cap for the whole series, I realized the need for a canon without realizing that’s what I was doing. Finally, then the prequels came out: three more films that produced spin-off novels for all ages, new comic books, computer games, and parodies. Two Clone Wars-based idiotic TV shows were produced and a really horrible little cartoony movie, and don’t even get me started on the new video games! Regular Star Wars, Lego Star Wars, Robot Chicken Star Wars . . . And unfortunately, as with pretty much all other writing since the turn of the last century, all the newest writing is complete and utter garbage with dubious grammar and shocking continuity. You could fill ten boxes with the stuff that exists with Star Wars stamped on the cover. (And I have.) And here’s the most important fact: they all contradict each other. An early series of juvenile books perpetuates that Palpatine had an insane son, but no evidence bears this out; likewise, the same series perpetuates that Vader’s glove could be found on the floor of the Mon Calamarian ocean, “blown there by the force of the Death Star’s explosion,” utterly ignoring that no explosion can blow something lightyears away, and Vader wasn’t even on the Death Star when it blew. (The same series also has Han buying a house on Cloud City and marrying Leia in direct contradiction of the events of The Courtship of Princess Leia. More here) The comic books by and large contradict the official book series, except for the comic trilogy Dark Empire which gets mentioned in the books. The ghastly NJO contradicts the entire fact that the series was supposed to end at Vision of the Future. Everything anyone ever said about Boba Fett before 2002 contradicts everything everyone ever wrote after 2002. The Clone Wars TV series and movie contradict the films and standard practice. You simply can’t accept everything with Star Wars on the cover if you want to avoid insanity! Naturally, everyone who likes Star Wars acknowledges the canonocity of the original trilogy: A New Hope, The Empire Strikes Back, and Return of the Jedi are the building blocks we all start with. Now, I think I’ve said before, Star Wars is like a coloring book: George only painted very broad outlines for us, and anyone can easily come in and make it any color they want. You are perfectly free to choose your own canon (but I think you’re an idiot if you don’t choose mine! . . . okay, kidding! ), acknowledging that due to internal contradictions, multiple fanons will, despite being able to coexist, override each other. For example, you might be an avid video gamer, but there’s no such person as Starkiller. You might love The Clone Wars TV series, too, but both of these things indicate Anakin or Vader taking on apprentices which simply is not demonstrably possible in the context of the other media. So you might choose to accept their canonocity over that which I list here, but keep in mind I have put these materials through extensive review, am always researching and studying new information as it comes to light, and have made the most logical possible choices in constructing and creating this canon. Day 27: A Female Character You Have Extensive Personal Canon For via Hundredaire Socialite. This post was ridiculously hard to accomplish; I’ve been agonizing about this for days, which was weird because I was positive with all the scifi and stuff that I’m in to, the nonhuman character question would be the easiest. Then I realized every nonhuman I like is male. Pickings were slim and I nearly gave up altogether, and then I realized that Aayla Secura didn’t need more than her few seconds of screen time in two movies to count — I’ve been crazy about her for years! So here’s the low-down on Aayla Secura, my favorite non-human character. She is also a type of character, which is why I paused to emphasize my love of Twi’leks. There’s very little to be known about Aayla Secura, but a lot to be inferred: she appears on screen in two scenes in Attack of the Clones — she is in the background as Obi-Wan goes to ask Yoda about the missing planet in the Jedi Archives, and again during the battle on Geonosis — and her death is seen in Revenge of the Sith on the planet Feluca. So she is a Jedi, one of the ones brought by Yoda to rescue Obi-Wan, Anakin, and Senator Amidala on Geonosis; she later fights in the Clone Wars and is stationed on the planet Feluca, where her clone troops turn on her and kill her. Really, not much more to know than that. Her death scene is a little weird, but then, all of them are . . . for example, how can Yoda on Kashyyk sense what’s happening to Jedi all over the galaxy, when the Jedi can’t sense the intent of their clone troops who are literally about to pull the trigger on them? Makes me think the Grand Egotist (Yoda) was doing a little long-distance brain-fuzzing. Anyhow, while it’s not unusual for me to pick random background characters and obsess over them, how did an obscure blue Twi’lek with only a few seconds on screen manage to get a name, an action figure, and such a following? You might as well know there are lots of comic books about her. I don’t comic book. (I also don’t idiotic-cartoons-based-on-cinema-classics.) But she did come from the comic books. In fact, Jon Foster’s cover art painting of her was what caught George Lucas’ attention, so that he asked for her to be included in two of the films. So that’s why I like her and stuff. Twi’leks are cool. Day 19: Favorite Non-Human Female Character via Hundredaire Socialite.